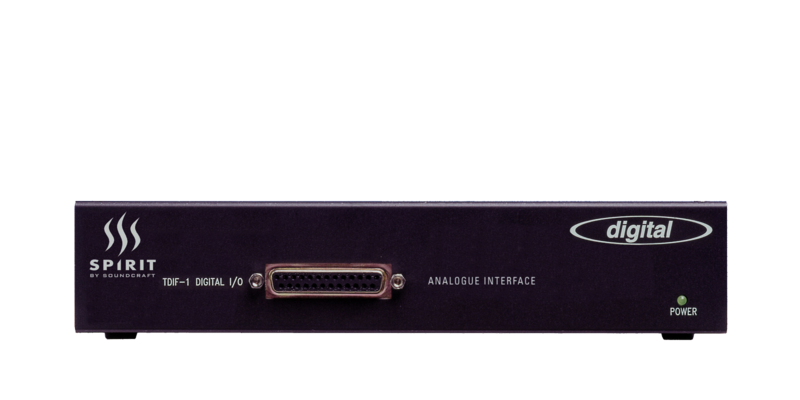 The analogue interface converts the digital TDIF port on the rear of all Soundcraft Digital consoles into 8 analogue Phono (RCA) inputs and 8 analogue Phono (RCA) outputs. All conversion is done using 20-bit technology. The unit allows a standard analogue multitrack to be connected, or to add 8 extra analogue inputs when you need to expand your operation. It will also allow the 8 TDIF outputs to be fed to units accepting analogue inputs. The Interface requires 1U half rack space and is shipped with power supply.